Vertical Ham Radio Antennas love ’em or hate ’em they are still a viable antenna for use in either two-way communications or simple shortwave listening. Why the bad press for verticals? Well to be honest some verticals really aren’t all they are cracked up to be. Claims made by the designers and/or manufacturers simply don’t hold up when the antennas are put into action. Many amateur radio operators put up vertical antennas in a hurry and tend to skip important considerations set forth by the manufacturer. Once the antenna is up it naturally works in a substandard fashion and the operator generally blames the vertical antenna instead of the fashion in which it was installed. 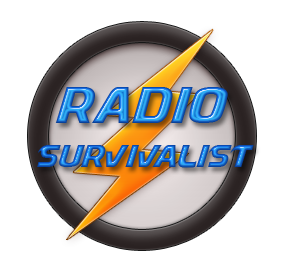 What’s Best For A Survivalist? Someone on the move will grab their bug out bag and their emergency radio kit complete with radios and an antenna system of some sort. There are many ways to build a vertical antenna but a survivalist must think of weight and ease of assembly. 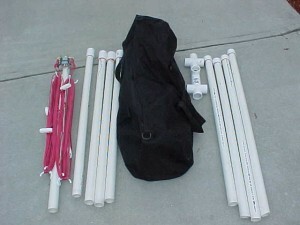 The picture to the right is an example of a self-contained antenna system ready to travel. In this case you merely find a good location for your vertical antenna, assemble the pieces shown above, connect the feedline to your radio and you are in business.